I have been working on ground textures for a while. How do you like it? Going in the right direction? Color variations could easily be done and support other types or rocky ground. The full version is 1800x1800px ... so 6in@300DPI. This is a downsampled version. It is hard to know what to say. It sure looks like sand. When you put a figure on top of it, does it look like sand or is it tending to gravel? Some of the bigger stones might need more shadow? It is really hard to tell without something for scale. Could be just me, but the stones seem to be lacking in weight somehow, as if they're floating above the surface a little, not lying on it. Their shapes are maybe a little too leaf-like, so that may be involved. Are they going to be used to form a battlemat-style grid eventually though, since that would make changing them harder? Thanks for the feedback. I will try to incorporate that into next versions. The rocks are shaped manually, and yes, now I also see them more leaf-like :-) Have to change that. I think I know where the floating feeling comes from. 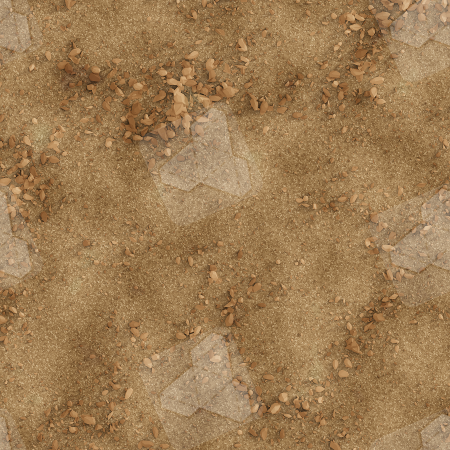 I made a ground texture with 250000 rocks as the base layer. Then I used that as a flat texture and placed the larger rocks on top. I guess I have to do it all in one go to make it look better. I dont know about battlemat grids. I am working in the usual 6x6in format. Are there better solutions? I wasn't suggesting there's some kind of different "standard" for battlemats, just using it as an example of a (hopefully familiar) type of product to show what I meant by "grid". Several publishers use gridding options made up of bits of the actual design - small rocks, flowers, leaves, etc. - so I mentioned it in case the size of "your" rocks on this sample was going to be important for creating such a "disguised" grid in this case. Interesting idea. 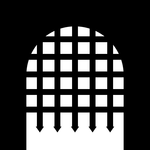 I planned to just do some (lines or dots) overlay option for the grid. I can play around if a placement of objects would make the lines obsolete but I fear it would feel unnatural looking. I can play around if a placement of objects would make the lines obsolete but I fear it would feel unnatural looking. Yes, that can be a problem indeed. Some of the most convincing versions of this idea I've seen are those by Inked Adventures, including the Forest Ambush tile, the Desert Cut-Up Sheets, and the free Leafy Dungeon Entrance 6 x 6 tile. These have often been applied with a very light touch, so just hints of the lines, and maybe a rock, a skull, a few leaves, or a little plant, at the nodes. One of the tips I got from Matt Lyon of WWG fame was that you don't want to be strict about illustrating every line and every corner of the grid. If you do that, you end up with something quite unnatural. Buried in this thread was my attempts at making a 'natural' grid using shells on the beach, and using ripples in the water. I can't argue that it's the best example, but it's one example that I have been involved with. I can see that it works well with illustrations. I have to see how it will look with a more realistic approach, but definitely a great idea.